CardMonkey's Paper Jungle: A Beautiful Award - "Green Blend" Bloggie Friends! 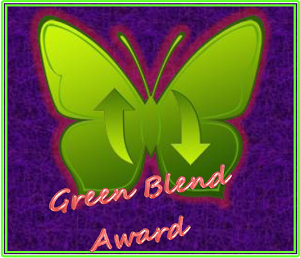 A Beautiful Award - "Green Blend" Bloggie Friends! "The “Green” portion represents how we should be kind to one another and help one another…such as being “Green” and helping our environment. Reissue the kindness that someone once gave to you as an infant blogger. Recycle the ideas you have learned or invented to pass along to up and coming crafters. Reduce the frustrations of wanting to a blogger with magnitude." This award is for any co-blogging friend who has helped me develop my blog in any and all ways. This award is for any co-blogging friend who has cheered me along in my blog building, craft advancing world. This award is for any co-blogging friend who consistenly stops by my blog and is kind. I can count on him or her to have posted one of the great comments at the end of my post. This award is to be given to 3 to 5 Blends whom I feel meet the listed requirements. Your BFFs may copy the award from my blog and proudly repost it. My BFFs may continue the kindness by issuing this award to keep the circle forever growing. ...I'm sorry this one's limited to 5, because I could have named SO many more. Thank you, to all of my friends and followers, for making me the sort of blogger I am today. Humbly, I honor you all for inspiring me to be a better papercrafter ... and person. Thank you for this beautiful award, Beckie! I'm honored to be one of your inaugural BFF's! Yay! Congrats my friend, you totally deserve any award going around. Thank You so much for the award! You deserve the award.